It was Transportation Theme Week around here, and boy, did we have an abundance of resources! By the time you have an almost-4-year-old, there are tons of cars, planes, trains and rockets around. I gathered all of our transportation toys to get ready for the week, and the girls could have kept busy playing with them all week even without any planned school activities! But we did them, nonetheless - here's a look at what we did. I saved some of our recyclable materials last week so that we'd have some good boat-making supplies. I put out a small box of parts and helped the girls to build boats. We ended up using some plastic fruit containers and their lids, bamboo skeewers, chopsticks and toothpicks for the masts, and construction paper for the sails. 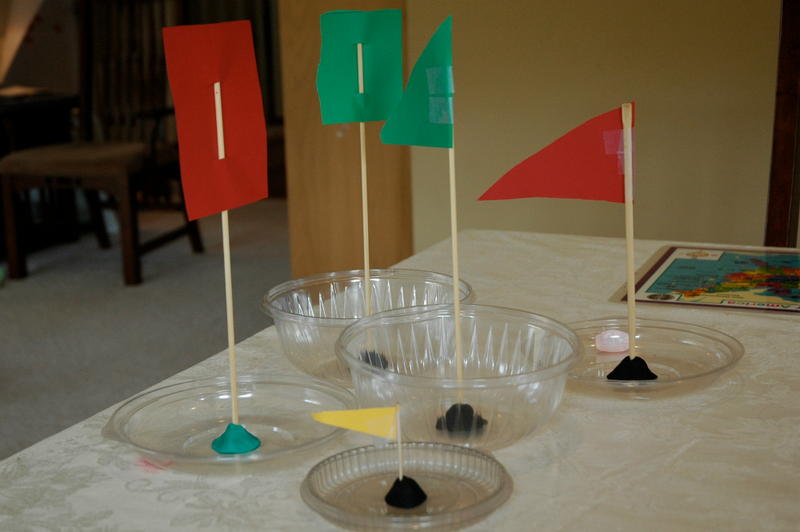 I stuck the masts to the boats with a little mountain of play-doh. This was a total hit. After we built our fleet, we took them up to sail them in the bathtub (tinted blue, for the ocean), and the girls 'sailed' for well over 30 minutes. This is definitely a classic transportation theme craft. I spread a sheet out on the floor, and moved the girls' craft table right to the middle, so they could access all sides and so that I wouldn't panic about possible paint on the carpet! Then I had the girls help me gather up all the (easily washable) cars and other vehicles in the house. We added paint, some nice painting music, and the girls dipped the wheels in the paint and created tracks all over the paper. After the paper was covered, we had a little car wash! A perfect chapter book read aloud for a transportation theme is The Mouse and the Motorcycle by Beverly Cleary. The girls love it so far! Maggie loves mice, so even though she's not old enough to understand a lot of the story, she enjoys the cute pictures. I loved these great transportation theme printables from Homeschool Creations. My favorite page was one to help children learn their left from their right. Lena is fairly inconsistent with this, so this practice page was helpful to her. After the girls built their boats, we took them to the bathtub to sail them. I encouraged them to add toys to see if they would still float. We watched as they got tippy, took on water, and started to sink. I made waves and they noticed that the shallower boats weren't as sturdy as the deeper boats. 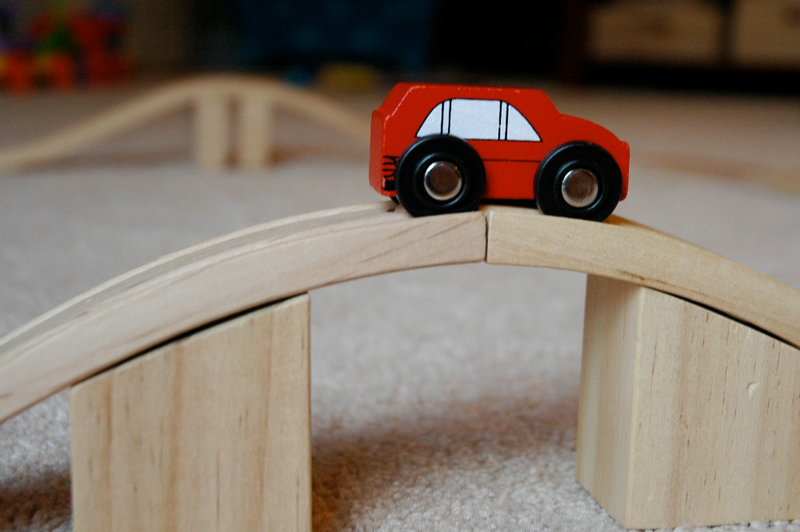 Another day this week we explored ramps and hills with our wooden train set. The girls watched as the trains went farther when let go from a steeper ramp as opposed to a flatter ramp. Lena did train ticket hole punching, inspired by The Polar Express. 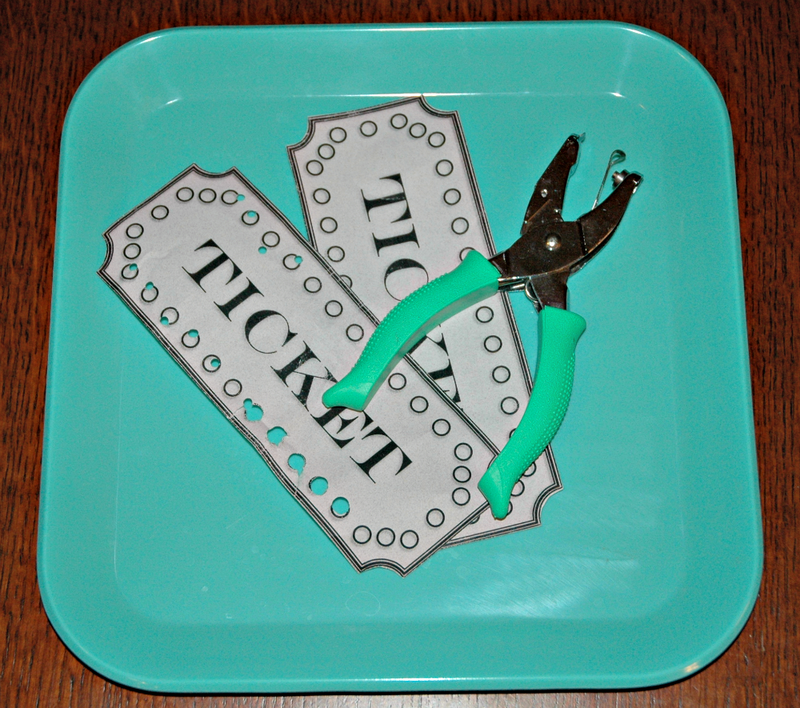 First I made up this cute ticket printable, then set Lena up with a hole punch. She has tried several times to use it before, but her hands haven't been big or strong enough. She could do it this time, though! I brought out our Cozy Coupe this week and let the girls drive around. We don't keep it out all the time, because it tends to be one of those things that they end up fighting over (and they eventually get bored with it, and it is SO BIG to just be sitting around). So it lives upstairs in Dad's office, and they squeal with delight when they get to play with it. They also rode bikes and scooters. How cute are is this traffic light snack? This post was our inspiration for this snack. 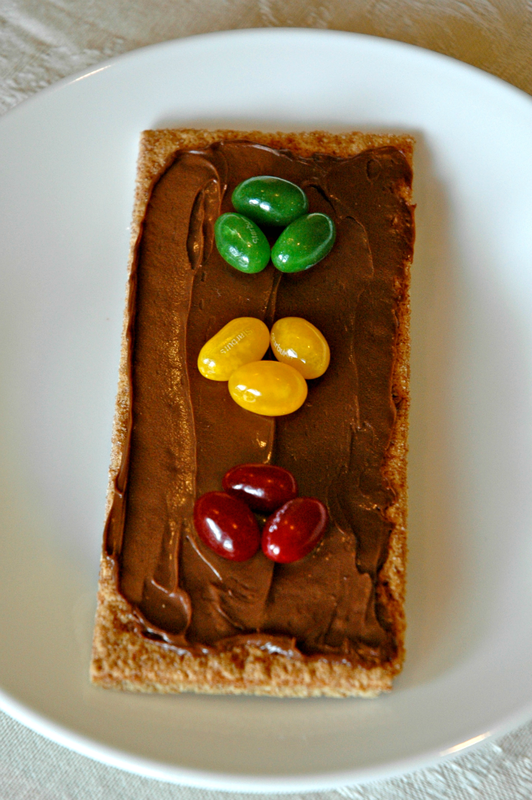 We used graham crackers, Nutella, and jelly beans. Certainly more sugar than I prefer to serve for a snack, but okay for a special treat. The girls loved it and had adorable chocolate faces afterwards. We watched some Thomas and Friends this week. You could also watch The Polar Express, Cars, or Planes. 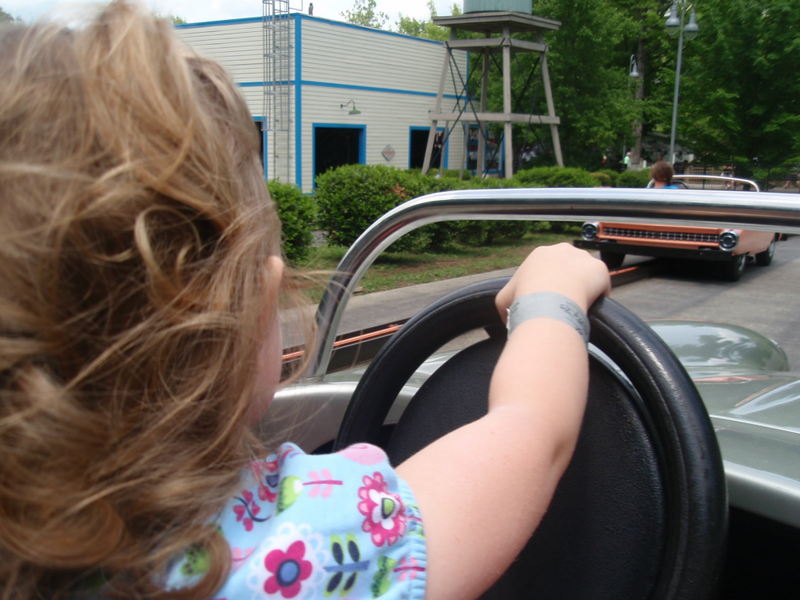 There is an amusement park about an hour away from where we live, and the girls and I visited (with some help from their grandparents) this week. We didn't go specifically for our transportation theme, but while there, we made sure to ride the old-fashioned genuine steam locomotive. They especially enjoyed hearing the whistle when we got to the top of the mountain! There was also a cute little car driving ride that we did. Lena and Maggie both got to drive; stay off the roads in 10-15 years! 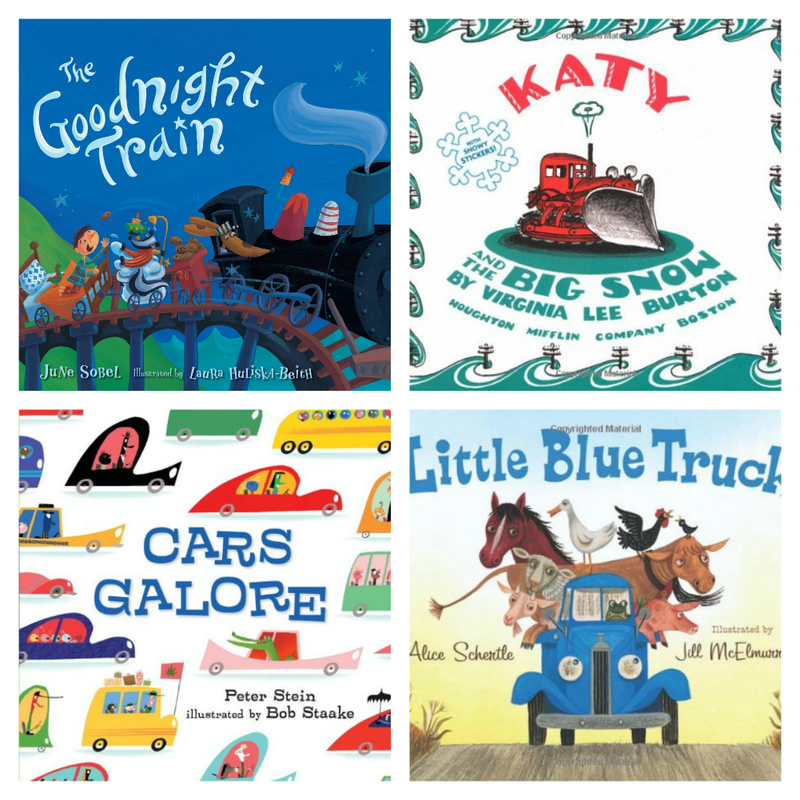 For more great ideas for your own transportation theme preschool week, visit the Cutting Tiny Bites Pinterest board below! 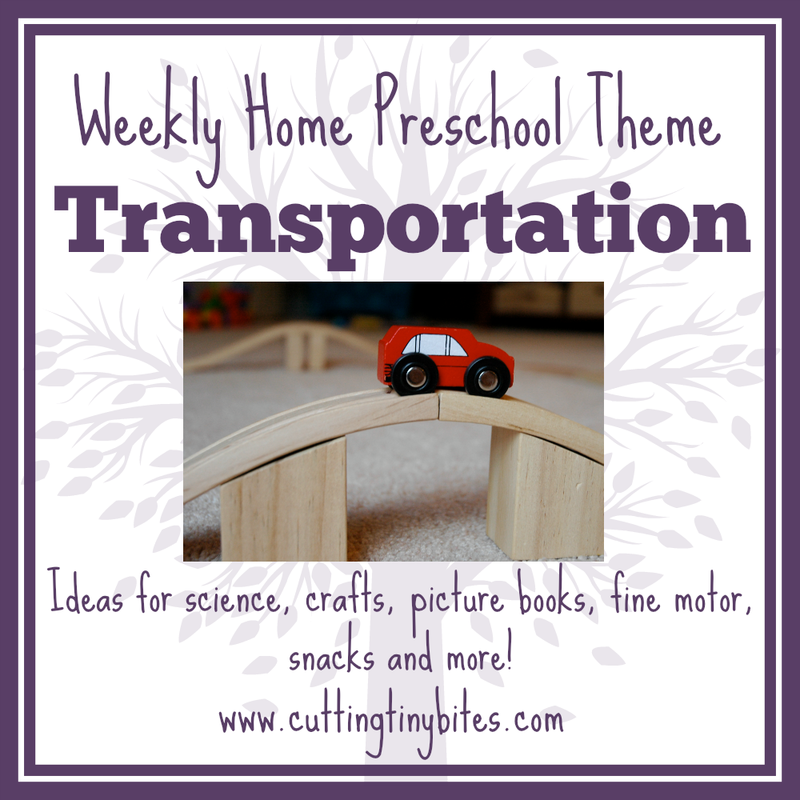 Transportation Theme- Weekly Home Preschool. 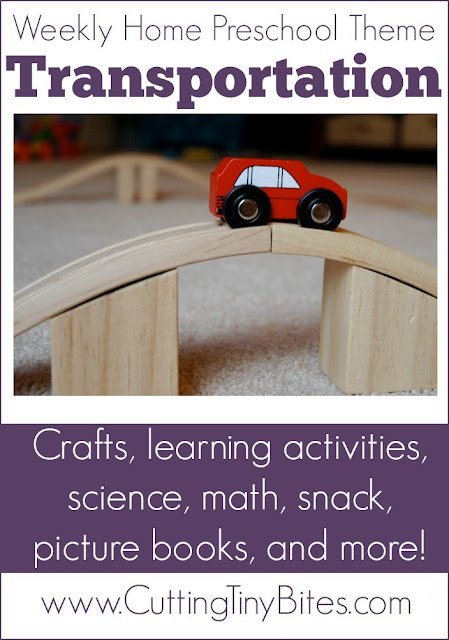 Science, math, crafts, picture books, gross motor activities, snack, and more! Perfect amount of activities for one week of EASY home preschool.